Smoked in the time honored tradition of the Northwest, all our products are chemical and preservative free... with no nitrates!!! Our natural brining and smoking processes combined with vaccuum seal packaging capture all the delicious flavor, moisture and oils, for an easy all occasion worry-free gift. Most of our products keep fresh up to two months in the refrigerator. A rich source of protein and omega 3 fatty acids, our smoked salmon is guilt-free and health-wise. Omega 3 has come to the attention of our health care professionals as a contributor to lowering of blood cholestrol. This can aid in the prevention of strokes and heart attacks, as well as lowering your risk of other conditions. Smoked salmon ranks among the lowest calorie foods available today at only 34 calories per ounce (Weight Watcher Magazine's Dining Out Calorie Guide, Second Edition). Join our Fish of the Month Club! You tell us exactly how you'd like it & we'll do it for you! Check out our Holiday Gift Boxes!! 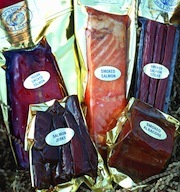 Twelve different giftboxes, including ..
Order Your Smoked Salmon Today!! SCRAPS, now also called SCRAPS: Parts Uneaten, is a culinary show airing on A&E Saturday mornings at 6am Pacific Time (9am Eastern) and on the FYI channel on Thursday evenings at 7pm Pacific Time (10pm Eastern). 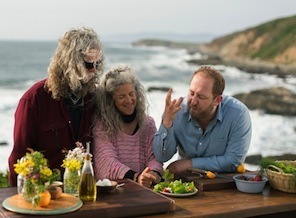 It's a 10-episode series filmed in different parts of the U.S., about using all the stuff many people normally throw away -- the tops of strawberries, funky avocados, shrimp shells, chicken bones, carrot tops, etc. 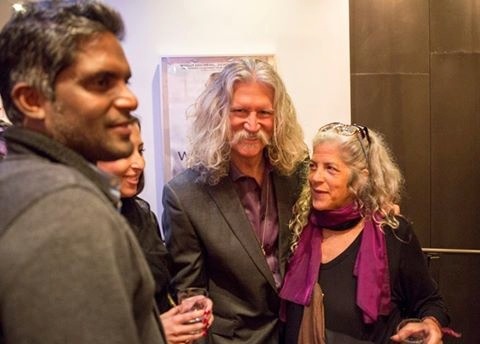 Bringing food waste awareness into people's kitchens in a really fun and warm way. Judging from the response to last season, it's making a big splash! The host of the series is Joel Gamoran, a wonderful fella who was our original sandwich maker when we started the lox biz in 2007. We hired him right out of culinary school. Katie Couric is the executive producer. Sally was the local California host for last year's Season 1 Episode 8 in Sonoma county, and the Cap'n is in that episode, too! Season 2 just started airing on October 11th with a 'Montana' episode. Sally will be in two episodes this fall -- the Thanksgiving Special, airing on November 8th & 10th, and she will be the host of Episode 10 from Vermont on December 27th & 29th. 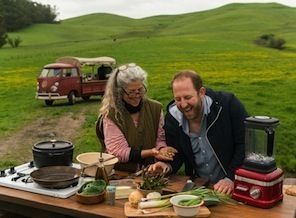 All the episodes are so much fun and have SUCH great scrappy food ideas in them. We hope that you can watch the show and that you enjoy it as much as we enjoy doing it! New episodes can also be seen on these streaming services..
Our episode from the first season is also available.. Season 1, Episode 8 "Sonoma"